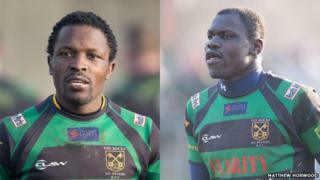 Two Ugandan rugby players who disappeared after coming to compete in the Commonwealth Games in Glasgow last year are playing for a small Cardiff team, it has emerged. Benon Kizza and Philip Pariyo claimed asylum and were housed near St Peter's Rugby Club in Roath. The club's chairman told Wales Online they had signed the pair after "a bit of bureaucracy". Uganda's rugby manager said transfer regulations had not been followed. Kasasa Yayiro, Uganda's rugby manager, told the BBC he had been unaware of where the two men were playing before speaking to the BBC. He said the players were part of the government-organised Commonwealth Games team when they disappeared. "I don't know what reason they gave. Officially the players never told us," he said. He added they had breached a code of conduct by staying in the UK and official regulations which allowed the transfer of players had not been followed. Kizza and Pariyo hit the headlines after they went missing during the Games in Scotland last summer and were reported to have been working in the Glasgow area when they failed to return to Uganda. They later claimed asylum and went to live in Cardiff in a hostel near the rugby ground. Their talent for the game was unveiled after a Communities First group approached the club and asked if some of the asylum seekers could use the field. Club chairman Joe Sweeney said Philip Pariyo told club coach, the former Wales international Mark Ring, he could play a bit and asked to join in. When the club realised the extent of the players' prowess, St Peter's made the move to sign them. Mr Sweeney told Radio 5Live: "We inquired a little bit into his background and why he was here and it transpired he was a Ugandan sevens' player." Mr Sweeney said the player's asylum application on political grounds had been successful. He described him as a "very talented player", adding: "You've got to bear in mind that he's a specialist sevens' player which requires a different skill set to the 15-a-side game, but with a coach like Mark Ring who's a specialist backs' coach he's under good tutelage. "There's no doubt at all that he's going to be very good for us." Pariyo played his first game for the club two weeks ago and scored two tries. Mr Sweeney said the club and community had rallied around to help Pariyo settle down and had put an appeal out on Facebook to help find him somewhere to live. "We've been offered so much property and furniture. It's been overwhelming. We've made him feel as at home as possible. He's obviously missing his family in Uganda but I think he's going to enjoy his life here as well." World Rugby, which oversees international rugby, said it had no comment to make on the case.